NPR is giving first listen to R.E.M. 's upcoming two-disc live set. R.E.M. Live At The Olympia hits shelves this coming Tuesday, October 27. But, thanks to NPR, you can listen to all 39 songs now! You read that right, you can stream all 39 tracks. R.E.M. 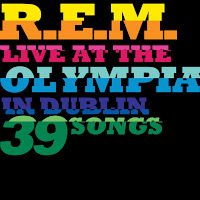 Live At The Olympia is a collection of fan favorites played live, not a collection of their hits. My geek girl love fest issues are in full bloom with this release. So, pop over, have a listen and fall in lust with R.E.M. all over again and or remember why you were and still are in lust with them in the first place. Click HERE to listen. What are you waiting for? !